ITWeb :Pink Elephant selected by South African Airways for IT transformation initiative. South African Airways selected Pink Elephant from a rigorous tender process, with the company focusing on the provision of clear, practical, service-oriented solutions and education, as well as introducing the “best of breed” newScale Service Catalogue as an accelerator. The newScale Service Catalogue software was proposed for its ease-of-use to drive self-service adoption as well as it proven ability to integrate seamlessly with its existing SAP enterprise systems and outsourced IT infrastructure. I think tomorrow's webinar is going to be a record. The number of sign ups is over 1,000 already. That's a lot of pressure for us presenters but a lot of fun. Are you in the market for a service catalog and portfolio? Or are you just curious as to what those tools ought to be doing for you? Are you using Excel and finding it difficult to but don't know what a better tool ought to have? Well, you are in luck! There's a webinar coming up just for you. EMA has created a whole criteria for selecting your catalog tool and you can get it for free from them. With more and more organizations deploying a Service Catalog as the cornerstone for ITIL – as well as leveraging it across non-IT functions including facilities and HR – the Service Catalog is well on its way to becoming the next “killer app” for the enterprise. This Web seminar will help you avoid failed investments in Service Catalog tools with limited capabilities, maturity, flexibility, scalability or performance – and ensure a successful Service Catalog deployment to drive down costs and increase the business value of IT. As an added bonus, all registrants to this webinar will receive a new White Paper written by the IT analysts at Enterprise Management Associates (EMA): Service Catalog and Service Portfolio – Criteria for Selection. This is free. As in free beer. It's now posted. You can find it here. It was a great seminar. Over 1100 registrations. Lot of good advice. Don't miss it. "How To" Service Catalog Guide – Updated for ITIL v3 Webinar. Hear first-hand from two of the industry’s preeminent Service Catalog experts, Pink Elephant's ITSM guru Troy DuMoulin and newScale founder Rodrigo Flores, as they provide guidance from this popular book. Troy are launching the the book tomorrow at our webinar. Hurry up and register before we run out of lines -- we are at over 900 registrations as of Sunday. The Service Catalog is the cornerstone of ITIL success. And with ITIL version 3, the IT Service Catalog is more important than ever. Learn from the authors of a new practical guide on how to get started! Pink Elephant and newScale teamed together to write the definitive “how to” Service Catalog book for ITIL practitioners 18 months ago – before the ITIL v3 refresh. This book, "Defining IT Success Through The Service Catalog", received rave reviews and was sold out several times. A NEW just-released second edition of the book is now updated with ITIL v3 content, and filled with even more practical advice and real-world examples. Troy and I are launching our new book with a a free webinar in two weeks. And the first 25 people get a free, signed copy of the book. So hurry up! First 25 to register get their own signed copy of the new book! Don’t miss this chance to learn how to design an IT Service Catalog according to ITIL version 3 best practices and be on your way to ITIL success. Next week I will be in Australia at the ITSMF Conference in Canberra, Australia so my posts will be ... Fewer or more depending on data rates. I will be documenting it with pictures from my new iPhone (if it doesn't break). If you are there, come and say hello. We have just announced our Service Catalog Conference 2008. For the first time, this year we are opening the conference to all end-user practitioners whether you are an existing customer or not. What makes this conference great are all the case studies and customer presentations; the chance to network with other people who are at different stages in their implementation. We'll see sessions on request catalog, service portfolio, finance and service costing. New this year, we are adding sessions specially useful for people who are just at the learning or planning stage. Whether figuring out what your objectives, learning how to run a catalog project, or getting consensus in your team as to what is a service, these sessions will be very useful. We'll have those up on the website soon. And I'll blog about it. And this year the conference is Palm Springs -- it will be a great event. I hope to see you there. As the foundation for defining services and communicating with the business, the Service Catalog can ensure a service-centric approach to ITIL. This panel session features ITIL practitioners and industry experts discussing the implications of changes from v2 to v3, perspectives on ITIL adoption, and how ITIL v3 can help increase the visibility and impact of your Service Catalog initiative. This session is open to all attendees. The rest of the agenda is here. We are going forward with opening our annual catalog conference to practitioners and partners. Your help with this two question will help us select the best topics for you. You can do it below or here Thank you. Update: Poll is closed. Thank you. In case you missed this webinar it is now posted online. Excellent presentation from Debra McMahon of Schwab. 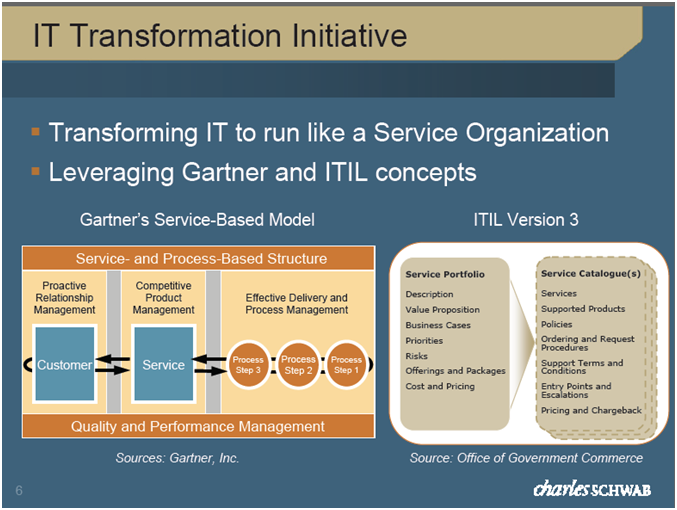 This slide below talk about how their initiative was based on both Gartner concepts for running IT as a business and ITIL V3. The full graphic is in the presentation. If you are interested in a real case study at a large financial services firm, this ought to be really good. Link: ITIL Webinar: Charles Schwab Case Study. This webinar is comig up on Wednesday. There's a good offer for a new white paper from EMA. Link: ITIL v3 and the IT Service Catalog. The Information Technology Infrastructure Library (ITIL) has become the de facto standard for IT service management. The new version of ITIL introduces four major changes that will dramatically affect IT and its relationship with the business. Register now to learn more! As an added bonus, all registrants to this webinar will receive a new White Paper written by the IT analysts at Enterprise Management Associates — "ITIL V3 and the IT Service Catalog". I recently gave a 45 minute talk on service catalogs at the itSMF e-Symposium™. They have now posted the talks. You can see it online here (Free registration required). I am back from the UK. We had an excellent event at the House of Lords, hosted by our partner 2e2. This was followed by a tour led by Lord St. John of Bletsoe. So at the risk of boring everyone, here is me standing next to the throne of England. When the topic of service catalogs is being presented at the tradition-bound House of Lords, you know it's mainstream.